Puppies rescued by South Paw Animal Rescue and Sanctuary in Tennessee. With today’s news from Arkansas about a puppy mill raid that rescued 175 puppies from filthy and dangerous conditions, I wanted to know a little more about the hard facts of commercial puppy breeding. Seven states are known as “puppy mill” states for the large number of puppy mills they harbor: Missouri, Nebraska, Kansas, Iowa, Arkansas, Oklahoma, and Pennsylvania. In these states and elsewhere throughout the country, over 4000 kennels are federally licensed to breed dogs. 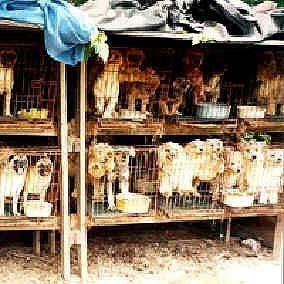 Approximately 500,000 puppies are sold by puppy mills each year, primarily in pet stores. The puppy industry in Missouri, alone, is estimated at bringing in $40 million dollars a year! The U.S. Animal Welfare Act (AWA) provides some protections for commercially bred domestic animals like dogs, but the standards are the bare minimum in housing, handling, sanitation, nutrition, water, veterinary care, and protection from extreme weather and temperatures. The AWA does not cover retail pet shops (unless they sell exotic animals), animals used for food or agricultural purposes, and cold-blooded animals like snakes. Despite the law, most puppy mills are extremely under-regulated. Puppy mill dogs are often rescued covered with matted and filthy fur, rotting teeth, and with ulcers in their eyes. They are kept in small wire cages – many breeding dogs have never touched solid ground or run and play. Several dogs are often kept in the same small cage, making fights (and injuries) common. The cages also cause problems for some dogs who panic when their feet get caught in the wires, causing them to lose feet and legs. Unregulated temperatures mean many dogs freeze in the winter or die of heat stroke in the summer; when wire cages heat up, they can “cook” puppies in their cages. The dogs used for breeding in puppy mills are bred from the first time they come in to heat until their bodies give up. This is often by the time they reach five years of age, at which point they are killed – sometimes by being bashed in the head with a rock. Other brutal techniques, like ramming a metal pole down a dog’s throat to rupture the vocal cords and debark the animal are common. Puppies are shipped to pet stores between the ages of 5 and 8 weeks (a prime socialization period) often without adequate food or water. The food fed the animals in the facility is typically bought by the truckload and often contains such a high level of things like floor shavings, that it has little to no nutritional value and causes rotting teeth early on. Man puppy mill puppies have hidden genetic problems and are susceptible to disease. Emotional problems are also par for the course, given the lack of socialization and proper nutrition they are subject to. Before you buy a dog from a pet store, even those that claim their puppies came from reputable breeders, be sure to ask the right questions. If a pet store will not show you paperwork on the puppy, the dog has come from a puppy mill. The only way to stop the cycle of abuse in puppy mills is to stop buying dogs from pet stores. Ginny is available for adoption at Muttville Senior Dog Rescue! Friday afternoon I got a text from Annie at Muttville that a sweet little Border Collie mix just came in and needed an immediate foster home. That evening I went to Muttville Manor to pick her up. When I walked through the front door half a dozen fuzzy little creatures came to great me, but none fit the description of my new girl. Sherri led me back to the kitchen to find a little black dog curled up on a soft bed in the corner. She was asleep and barely lifted her head when we walked over to her. 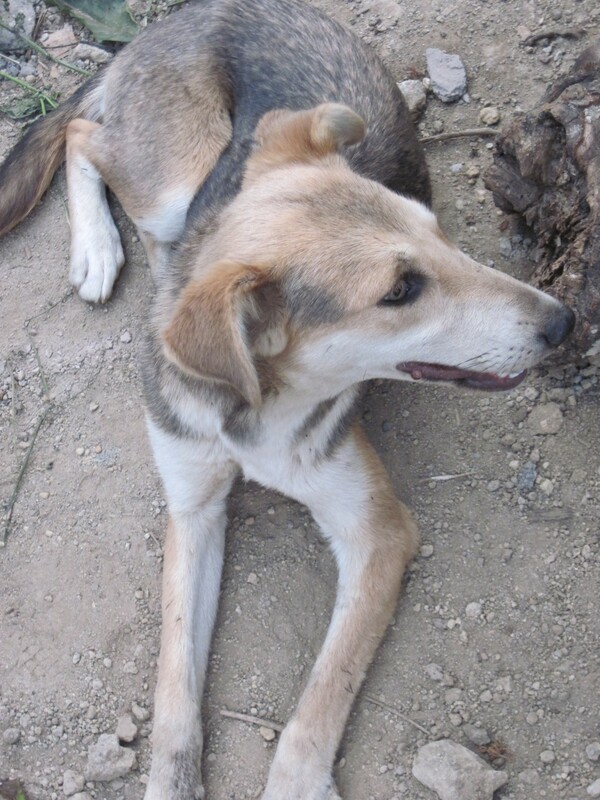 Ginny was found starving in a ditch it Grass Valley. Apparently her owner passed away and the family, instead of doing something humane like dropping her at a shelter, left her to die. Ginny is deaf and one of her ears was either deformed from birth or was damaged in some kind of unintentional (or, god forbid, intentional) accident. Ginny has hyperthyroidism and is on an anti-fungal medication. She is itchy; her underbelly is scaly and hairless and in the spots she has fur, it only thinly covers a flaky, dry mess of skin. Ginny is also significantly under weight. Her skin is loose and her ribs are too visible. Ginny stole my heart immediately because she looks much like the dogs that overrun rural Central America – starving mutts with thinning hair, desperately trying to appease anyone that might give them food rather than kick them or hit them with a stick. And then, she was found. She was taken to the vet and nursed back to health. She put on a little weight and, when it was time, Muttville took her in. After almost 48 hours with her, the light is already coming back in to Ginny’s eyes and with a medicated bath and a good brushing yesterday she is looking quite handsome. Ginny is a great sleeper but she’s also quite an active girl. She has an independent streak – she isn’t afraid to be in a separate room alone – but she has already begun to ask to be let up on the couch or bed to snuggle warmly against me. Ginny is fully house broken and today I discovered she likes toys! Ginny is a food monster and can’t get enough of any yummy treat that may come her way. Many dogs that have experienced starvation guard their food; Ginny doesn’t seem to be showing that behavior but she did give me a growl when I got too close to the Bully Stick she was happily chomping on. Ginny was overwhelmed by the half a dozen dogs in her face at Muttville Manor, growling to warn them to back off, but in a relaxed environment, like meeting another pup on the street, she has had no trouble at all. I predict that in the next week or two, Ginny will become increasingly playful and loving. She walks nicely on a leash and, although she has a small limp on her rear right leg, it doesn’t seem to bother her. Once her health improves, I imagine she will be a pro-walker. Ginny is a wonderful senior dog that deserves a forever home where she will be appreciated for her sweet nature. For more information, visit Muttville’s website! By the end of Thanksgiving, I felt ready to let Franny go. Well, not to let her go, but to open my home and my heart to another dog in need. The house feels strangely empty without a dog and, let’s face it, the cats are getting a little uppity without one here to give them the stink eye. So on Tuesday morning I contacted Muttville; eight hours later I met Bruno. I picked Bruno up from a grooming session at Animal Care and Control in San Francisco. Clean and with a handsome new haircut, he greeted me (and the bits of hotdog in my hand) with a happy wag. Bruno appears to be a Corgi/German Shepherd mix. 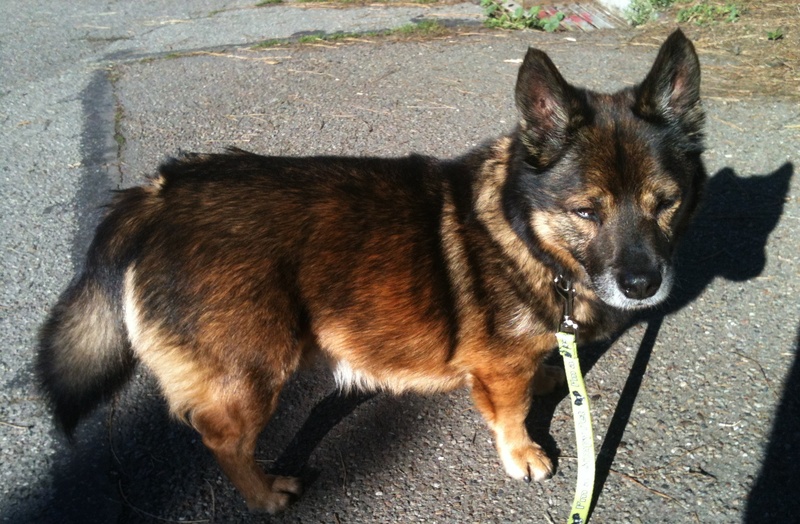 He has short little legs and a thick, long body with a deep chest, but his face and tail are all Shepherd. So is his thick, beautiful double coat! Bruno came from the Stockton shelter and we aren’t sure what his story is. He’s a sensitive soul and is a bit guarded when it comes to unfamiliar hands groping his sensitive underbelly. Sadly, he was so stressed out in the shelter that this sensitivity became fear which looked to potential adopters like aggression; they had trouble getting near him in his cage. 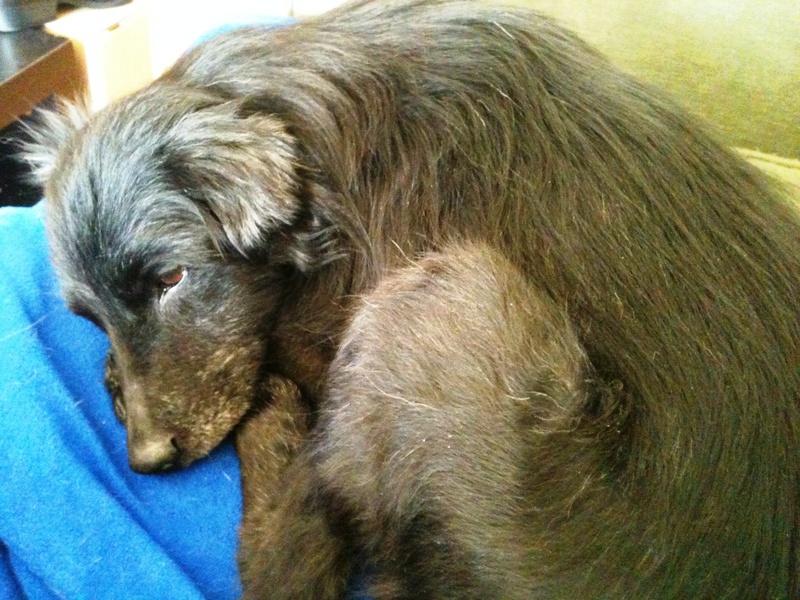 But after a week at Muttville manor, Bruno was a totally different dog: friendly, sweet, and mellow. Bruno did very well with all the other dogs at the Muttville manor but I think he’s happy to rule his own roost here at my little zoo. He has done wonderfully with the cats, Osito and Phoebe; he even seems a little nervous about them (maybe he got too close to an angry claw in the past?) Bruno is a quiet and thoughtful guy – I haven’t yet heard him bark. He’s pretty independent but he also loves people. He enjoys sprawling out on the couch during t.v. time just as much as he loves to go on walks. At the dog park he did beautifully! Bruno is 8-10 years old, weighs around 35lbs, and is available for adoption through Muttville Senior Dog Rescue! Can you give this happy little man a forever home for the holidays? 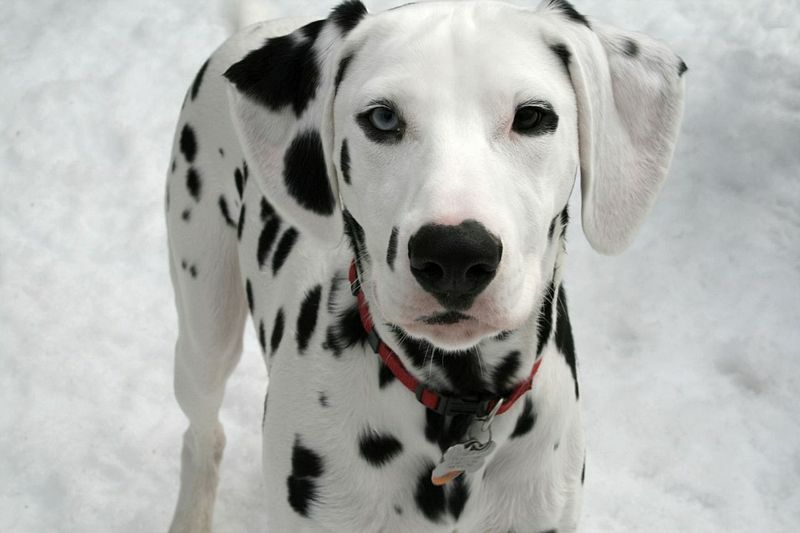 Dalmations are a beautiful but unpredictable product of generations of selective breeding. Purebred dogs are celebrated in our culture. They win awards, they reap huge stud and puppy fees, they start in commercials and television. Sadly, our love of pure breeds is leading to their demise. Organizations like the American Kennel Club reward animals that are visually perfect but in genetics, when you selecting for one characteristic, can make totally unrelated changes in a breed that were never anticipated. In other words, if you attempt to breed purebred Huskies with blue eyes, you may inadvertently create a more nervous and fearful animal. The classic example of this cause-and-effect breeding selection comes from a geneticist named Dmitry Belyaev. In 1959 he began an experiment with wild silver foxes in Russia. Dr. Belyaev wanted to see if he could domesticate the silver fox to make it tame. In each generation of foxes, he selected the most tame individuals and then bred them; this continued through thirty generations. By the experiment’s end, the silver foxes were super tame (though not as tame as dogs). But what’s more interesting is that even though Dr. Belyaev was only selecting for tameness, the foxes changed physically, too: their coats changed from silver to a patchy black and white (like a Border Collie), their tails started to curl up, and their ears flopped down. The foxes also developed smaller heads and the skulls of the male foxes became more feminine. Sadly, all this selective breeding also created neurological problems like epilepsy. They had lower levels of stress and higher levels of serotonin, which inhibits aggression, which is good in a domestic context, but would get them killed in the wild. Some of the fox mothers even started eating their babies. The same kind of thing is happening with the most popular dog breeds in the U.S. Golden Retrievers are bred for their calm temperaments but lately they are also starting to develop unusual aggression problems that were never present in the breed before. This is because fear is a “check” on aggression; fear keeps a dog from being too aggressive. 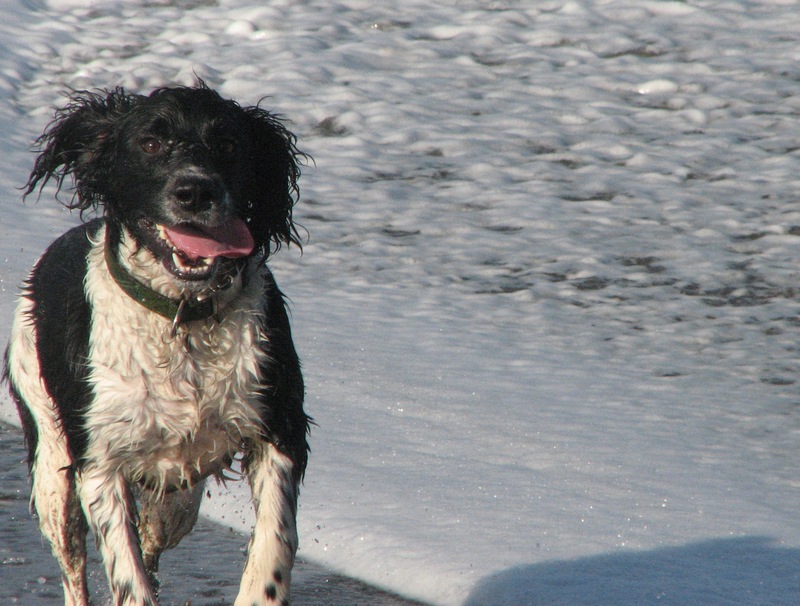 A calm dog is a low-fear dog meaning he is also potentially a high aggression dog. The pool of purebred, breedable dogs is relatively small so inbreeding is also standard in the world of pure breeds. All this inbreeding, combined with selectivity, has also created a number of common illnesses and physical conditions that were previously uncommon to the breed such as seizures, hip dysplasia, heart disease, eye problems, and more. This does not mean that all purebred dogs are genetic monsters; they’re not. But it is important to choose carefully when looking for a purebred puppy or dog. Sadly, even purebreds end up homeless so, rather than buying a dog from a breeder, consider adopting a dog from a breed rescue group. These organizations exist for nearly every breed out there and do the tireless work of protecting the designer dogs that get lost in the shuffle. For breed rescue groups in your area, visit www.akc.org. *Modern Hound can help you find the perfect purebred dog for your family. Visit www.modernhoundsf.com for more information! My next door neighbors have two gorgeous dogs – Monkey, a calm and gentle Great Pyrenees, and Nash, a Blue Nose Pit Bull puppy. All puppies are exuberant but Nash is a special boy. At four months he was a bounding bundle of energy; at 7 months he is now a BIG bundle of energy. Franny hates Nash. She hates pretty much any dog that isn’t dignified and calm. So on the days I let Nash and Monkey out for a potty break in my back yard, I know I’m in for a grumpy Fran. I love pitbulls and have for years but, like Franny, many people are not fans. Sadly, it is the pit’s reputation and the humans that have shaped them that are the problem, not the dogs themselves. But what is a pit bull, really? Pits are a cross between terriers and bulldogs first bred to create a dog with a terrier’s tenaciousness and a bulldog’s athleticism. Pit bull is not a breed, it is a group of several different types of dogs with similar characteristics. Pits are intelligent dogs and are used as companion animals, police dogs, and therapy dogs; in the early 20th century, they were as popular as labs are today! Pit bulls have a higher tendency towards agression than many other breeds. This is what has created a culture of fear around pit bulls in the US. Of the 238 humans killed by dogs between 1979 and 1998, 32% have been pit bull attacks. Sadly, this is truly a case of a few bad eggs ruining a whole cake. The vast majority of pit bulls are sweet, amazing dogs. But their reputation has led to various forms of legislation banning their ownership, requiring that all pits wear muzzles, and more. Pit bulls are the hardest dogs for shelters to adopt out, in part because they have special requirements for their ownership. At the SF SPCA, for example, an adopter needs to bring all members of the household (including other dogs) to meet the dog and a note from the landlord approving the ownership of a pit bull by their tenants. Not many landlords out there are willing to take the liability risk. The situation was/is so bad that in 1996 the SF SPCA renamed pits as “St. Francis Terriers” in the hope that they would be more readily adopted. Luckily, many residents of San Francisco have discovered how great pits are. With a pit, early socialization and training is key, but with a little effort, they are amazing companions! If you are interested in adopting a pit, please visit a shelter or rescue organization and not a breeder. Even if you are searching for a puppy, rescues have plenty. Breeders are not only putting more dogs out there to eventually end up in shelters (over 50% of all puppies will end up in a shelter by age 2) but they often select for physical traits, not behavioral ones, and whenever a breed is shaped according to physical characteristics, it will automatically become more agressive. Check out some of these pit-bull specific rescue organizations! 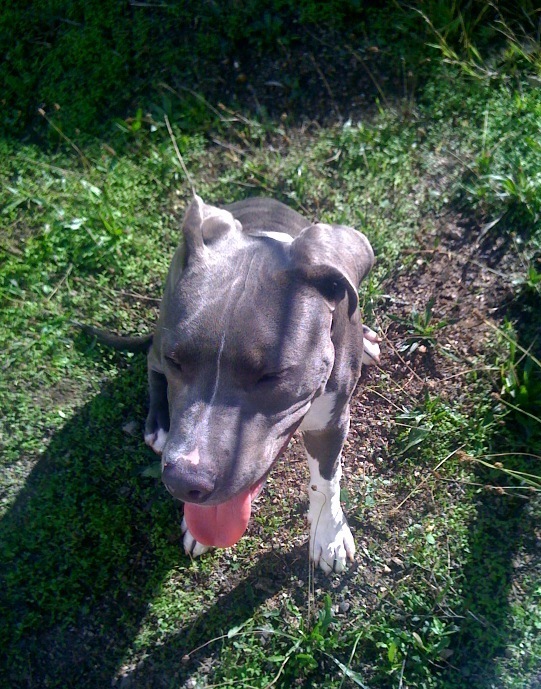 If you are looking for a pit bull but want to make sure you adopt the right one, contact me at www.modernhoundsf.com! From the 1960s to the 1980s, Guatemala regularly made international headlines. A U.S. backed military coup which deposed populist president Jacobo Arbenz was the beginning of a 30-year civil war which killed over 200,000 people and displaced millions. The war is now recognized as genocide; those killed were almost entirely indigenous Maya people who, though they made up over half of the population, were kept at the bottom of the social, political, and economic ladders. The coup and genocide that followed were called efforts to eradicate communism that had reared its ugly head in Central America. In reality, they were efforts to stop the rising consciousness of Maya people that they were more than poor farmers with no power. The last couple of weeks Guatemala has been in the news. The presidential elections held on September 11 resulted in a run-off between two candidates, one of which – Otto Perez Molina – was a general during the civil war and is, himself, responsible for the massacre of thousands of Maya people. And then the US admitted that they had used Guatemala for a test ground for studying the effects of syphilis, infecting hundreds without their knowledge. With this kind of history, it is not surprising that, among the suffering in Guatemala are millions of dogs. In my previous life I travelled several times a year to Guatemala, at times staying in rural villages for weeks at a time. One of the most difficult things I ever had to deal with, however, was not the poverty but the incredible suffering of the canine population. In all of the developing countries I have visited in Central America dogs are considered the scum of the earth. I have seen puppies so thin they are literally skeletons. I have seen dogs punted like footballs for amusement. I have seen dogs with such severe infections they can hardly move. In the poorer communities, dogs are not fed…people can hardly feed themselves. It’s literally a dog-eat-dog situation where, if you can’t challenge others for food, you die a slow and horrible death. There are so many dogs that need rescue here in the US, it’s easy to forget that dogs elsewhere in the world are in desperate need. Animal Aware is overwhelmed with animals and are constantly in danger of closing because of a lack of funding. Today take a minute to visit these dogs and – if you have the means – to give a small donation.